Mosaic composed of 102 Viking Orbiter images of Mars, covering nearly a full hemisphere of the planet (approximate latitude -55 to 60 degrees, longitude 30 to 130 degrees). The mosaic is in a point-perspective projection with a scale of about 1 km/pixel. The color variations have been enhanced by a factor of about two, and the large-scale brightness variations (mostly due to sun-angle variations) have been normalized by large-scale filtering. 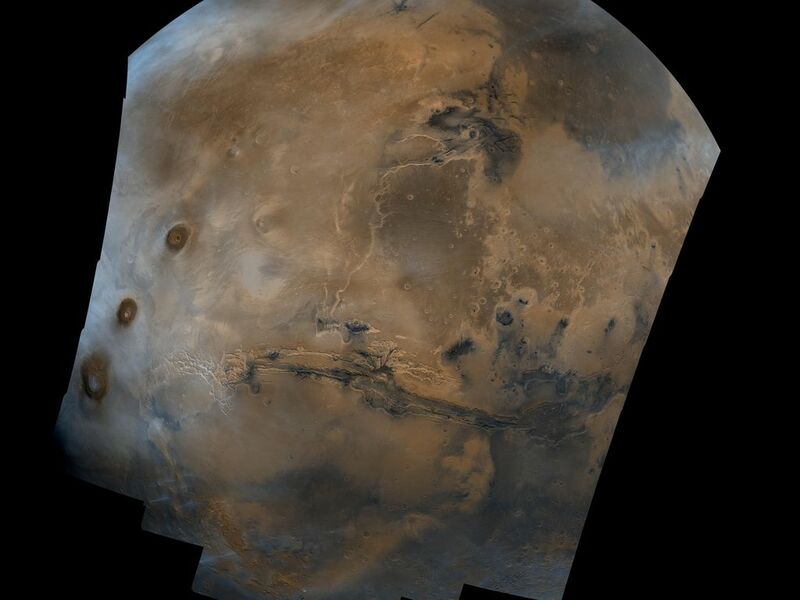 The center of the scene shows the entire Valles Marineris canyon system, over 3,000 km long and up to 8 km deep, extending from Noctis Labyrinthus, the arcuate system of graben to the west, to the chaotic terrain to the east. Bright white layers of material in the eastern canyons may consist of carbonates deposited in ancient lakes. Huge ancient river channels begin from the chaotic terrain and from north-central canyons and run north. Many of the channels flowed into a basin called Acidalia Planitia, which is the dark area in the extreme north of this picture. The Viking 1 landing site (Mutch Memorial Station) is located in Chryse Planitia, south of Acidalia Planitia. The three Tharsis volcanoes (dark red spots), each about 25 km high, are visible to the west. The large crater with two prominent rings located at the bottom of this image is named Lowell, after the Flagstaff astronomer. 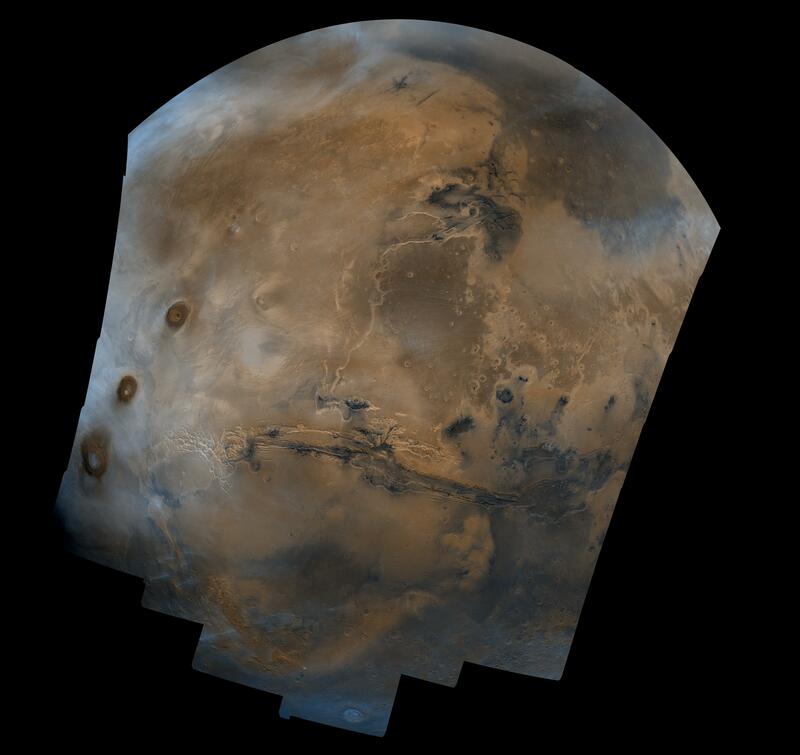 The images were acquired by Viking Orbiter 1 in 1980 during early northern summer on Mars (Ls = 70 degrees); the atmosphere was relatively dust-free. A variety of clouds appear as bright blue streaks and hazes, and probably consist of water ice. 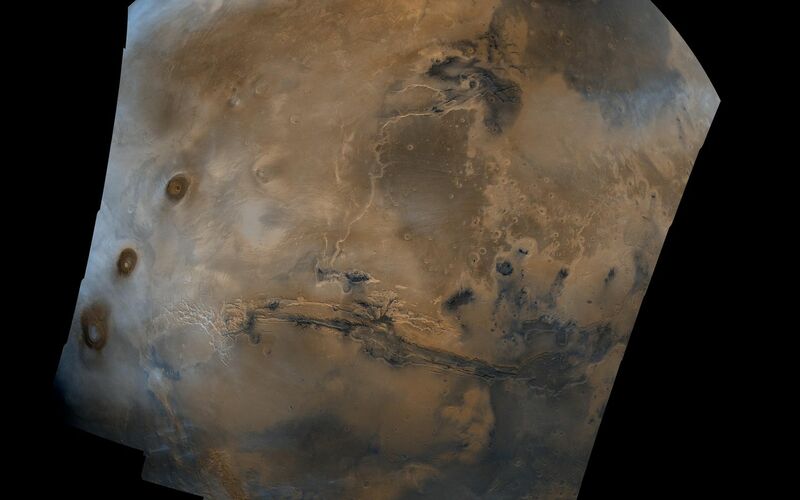 Long, linear clouds north of central Valles Marineris appear to emanate from impact craters.